Marine Corps Study: All-Male Combat Units Performed Better Than Mixed Units : The Two-Way The yearlong study found that all-male squads did better than mixed groups in 69 percent of the tasks evaluated. It's unclear what this will mean for the future of women in ground combat jobs. Marine Lance Cpls. Julia Carroll (left) and Paula Pineda lift "Carl" — a 220-pound test dummy — during training in March in California. Female Marines have completed months of training and are now waiting to hear whether they will be allowed to serve in combat roles. 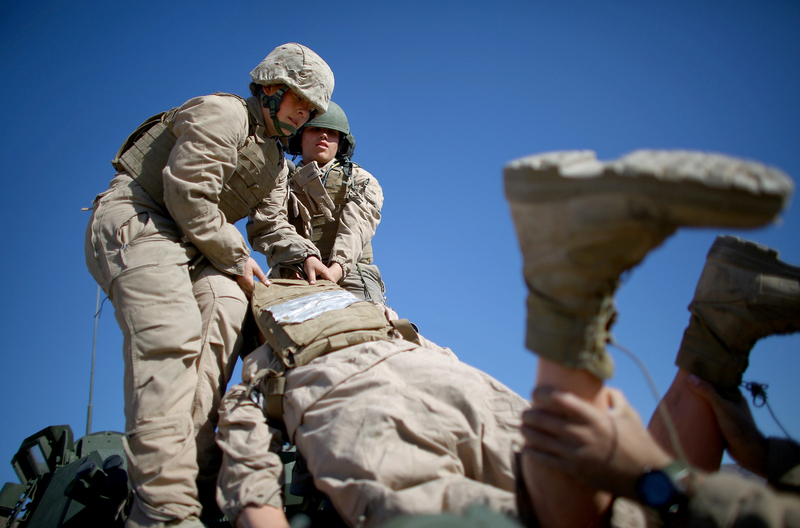 A yearlong Marine Corps study trying to understand how gender integration would affect combat readiness has found that all-male units were faster, more lethal and able to evacuate casualties in less time. Overall, according to a summary of the study, all-male squads performed better than mixed groups in 69 percent of the tasks evaluated. "The Marines created a battalion of 100 female and 300 male volunteers. During the past year, they trained in North Carolina and California, taking part in realistic combat exercises. "All-male squads, the study found, performed better than mixed gender units across the board. The males were more accurate hitting targets, faster at climbing over obstacles, better at avoiding injuries. "The Marine study says its main focus is maximum combat effectiveness, because it means fewer casualties. The Marines have not said whether the study's results will lead them to ask for a waiver that bars women from ground combat jobs. "Defense Secretary Ash Carter said he hopes to open all combat jobs to women." The Pentagon lifted a ban prohibiting women from serving in combat in January 2013. The question since then has been whether the military could open up those jobs without lowering standards. Of course, this news comes just weeks after two female soldiers graduated from the U.S. Army's Ranger School at Fort Benning, Ga. As we reported, it's a grueling course that "puts a premium on physical strength and endurance." The summary of the Marine Corps study quotes a 1992 report from the Presidential Commission on the Assignment of Women in the Armed Forces. That was the last time the government studied the effect of gender integration on ground combat units. According to that commission, winning a war is sometimes "only a matter of inches." Back then, the commission concluded: "unnecessary distraction or any dilution of the combat effectiveness puts the mission and lives in jeopardy. Risking the lives of a military unit in combat to provide career opportunities or accommodate the personal desires or interests of an individual, or group of individuals, is more than bad military judgment. It is morally wrong."